How to set up a PVC cage (AP T8) With Pictures! Thread: How to set up a PVC cage (AP T8) With Pictures! Re: How to set up a PVC cage (AP T8) With Pictures! I'm glad it helped. If you have any questions feel free to ask. Awesome write-up and great pictures! I'm considering getting a couple of these in the future and this was very helpful! I was just wondering how heavy they are and how easy they are to move around? 1.0 brazilian rainbow boa "Helix"
1.1 corns - bloodred "Jambi", creamsicle okeetee "Aurora"
1.0 striped california king "Nix"
0.1 yellow tiger crested gecko "Ember"
They aren't too heavy, my guess would be somewhere around 20-30 lbs. 1 person can move a T8 without issue but 2 people makes it much easier (just because of the bulk) they are easy to assemble and dissemble so if needed that is another option. Last edited by The Serpent Merchant; 03-27-2012 at 10:26 AM. Hello again! Whats holding the divider in place? it is some kind of slot? also, if you divide the cage , but still need secondary heating in form of a radiant heat panel to keep appropriate ambient heat. How would one go about heating the whole cage, with only one RHP and with the divider in place? Airholes in the actuall divider? Last edited by Natassja; 04-25-2012 at 08:42 AM. Last edited by The Serpent Merchant; 04-25-2012 at 09:34 AM. So I'm going in a different direction (turns out the roomies don't want me to have a rack with multiple snakes but a PVC cage is perfect because it saves on having to keep an entire room warm). If I go the T8 route with the divider, do I need to buy two of the flourescent lighting fixtures if I want the light or do I need two? Also, if I go with the flexwatt, is the RHP necessary? The room I guess can dip below 65 or 70 in the winter but in the summer I doubt ambient will be an issue at all. Black Pewter het Hypo Vestris; Black Pastel Enchi Zamira; Black Pastel Cheryn; Hypo Enchi Sofia; Lesser Pastel Eren; Super Mojave ??? ; Piebald Mako; Fire Vin; Pastel Estelle; Spider Hanji, Ezri; Normal Angelina, John, Aradia; Mojave Joe; Anerythreustic Kenyan Sand Boa ??? ; German Shepherd Dog Atticus; Rats Snowman, Colette, Calliope, Eliza, ?? ?, ??? When using the divider you will need 2 lights. How long during the winter does the room get to 65? If it is only a few days then RHP's probably aren't worth the extra cost. This is awesome Aaron! Just out of curiosity, since you use Flexwatt, do you have to lift the cages or be careful on what type of surface you place them to keep the Flexwatt from trapping heat beneath the cage or starting a fire? I always wondered how that worked when using Flexwatt for UTH because your typical UTH requires that the cage be lifted slightly and not be placed on any wood surface or something likewise flammable. My cages sit on the 8" stand made by AP, it is made from the same 1/2" PVC that the cages are. 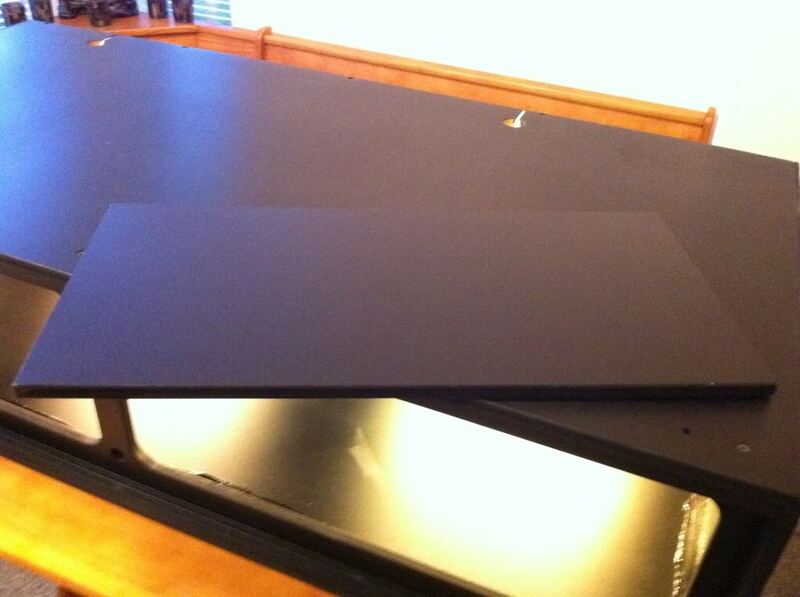 Before I got the 8" stands I used the pastil tables with fold out legs and TV tray tables lol. the Flexwatt when regulated by a thermostat shouldn't get much over 100 degrees ever. my hottest thermostat setting is 102.5 right now. While I wouldn't trust that sitting directly on my carpet... I would put it on wood or most plastics. As you can se my cages are stacked on top of each other, and there is flexwatt sandwiched in-between them. I haven't found any need for an air gap or anything like that so far. This is because the thermostat probe site in the slop in the bottom of the cage... so it would detect any build up of heat and turn down the power going to the flexwatt.